The Christmas story is one of hope and joy. It’s evidence that when God makes a promise He is faithful to fulfill it and He allows people to be a part of bringing His promises to fruition. How often do we read about Joseph and Mary but don’t stop and really think about the story behind these people who were willing to do what God asked of them? They took on a great responsibility and they were up to the challenge, but the choices that each had to make were life changing. God asked Mary to give birth to the Messiah and she and Joseph were to raise and protect Him until He became an adult. Every parent should take raising a child as a serious responsibility, but when the Child is the Saviour of the world, that takes very special people. Many people think that Mary was more than a mere human. This idea doesn’t come from the Bible and cannot be supported by Scripture. Mary was a normal young woman, possibly a teenager who had hopes and dreams of marriage and a family like all young women. Her lineage is given to us by Luke who traces it back to King David through his son Nathan (Luke 3:31), and further back to Judah (Luke 3:33), and right on back to Adam. The birth of the Messiah had been prophesied by Old Testament prophets and women throughout the ages hoped to be the one to give birth to Him. When a woman married, her desires changed. She and her husband would have children, and she would be disqualified because she was no longer a virgin. “Therefore the Lord himself shall give you a sign; Behold, a virgin shall conceive, and bear a son, and shall call his name Immanuel.” Isaiah 7:14. With God, all things are possible, and the virgin birth was no exception. In Mary’s day, if a woman who wasn’t married became pregnant she would be condemned under Jewish Law and could be stoned to death. The choice Mary would soon make could have meant her death. She was promised in marriage to a carpenter named Joseph, but the wedding ceremony hadn’t taken place; Mary was a virgin. Her life was normal and nothing out of the ordinary until the angel Gabriel appeared to her. “And the angel came in unto her, and said, Hail, thou that art highly favoured, the Lord is with thee: blessed art thou among women. And when she saw him, she was troubled at his saying, and cast in her mind what manner of salutation this should be.” Luke 1:28-29. “Troubled” means she was scared! Gabriel saw her fear and calmed her saying that she had found favor with God. That must have made her feel a little better but his next words would have been shocking. “And, behold, thou shalt conceive in thy womb, and bring forth a son, and shalt call his name JESUS.” Luke 1:31. I often wonder what went through Mary’s mind. She knew the penalty for being pregnant and not married and Joseph would have every right to walk away from his commitment to marry here. There would be gossip to face and what would her parents say? Scripture doesn’t say that Mary hesitated nor did she ask for time to think about it. She didn’t discuss the pros and cons with friends about it or flip a coin. She simply asked how. “Then said Mary unto the angel, How shall this be, seeing I know not a man?” Luke 1:34. God always gives us a choice, and Mary chose to obey God. No wonder He chose her for such a special task. She had a heart to obey God no matter what it might mean to her personally. Christians can learn from Mary’s attitude and not question God, but simply obey Him. “And the angel answered and said unto her, The Holy Ghost shall come upon thee, and the power of the Highest shall overshadow thee: therefore also that holy thing which shall be born of thee shall be called the Son of God.” Luke 1:35. Mary’s next words show strength of character. She didn’t understand how it would be accomplished, but trusted God to make it happen. “And Mary said, Behold the handmaid of the Lord; be it unto me according to thy word. And the angel departed from her.” Luke 1:38. It was a simple answer but very profound. Her life would be changed, but her willingness to serve God is a beautiful testimony of faith. Mary had to trust God to work out the details. If she was given a reprieve from being stoned, she was still without a husband to care for her and would be an outcast. God doesn’t do a half-way job when He asks us to step out in faith. Though she wasn’t married, she was promised in marriage to Joseph who must have been a remarkable man. God had chosen him for the task of caring for Mary and for the Baby she carried. The Gospel of Matthew tells us a little about Joseph. Like Mary, Joseph was also a descendent of King David, but his line was through David’s son Solomon (Matthew 1:6). This was the royal line. Scripture doesn’t tell us much about Joseph, but what it does say describes a very honorable man. He and Mary were to be married, but suddenly she became pregnant. He knew the child wasn’t his and he would have been within his rights to publically bring charges against her. He thought about his options and was considerate of Mary when deciding what to do. “Then Joseph her husband, being a just man, and not willing to make her a publick example, was minded to put her away privily.” Matthew 1:19. Though the marriage hadn’t taken place, the betrothal was a binding agreement upon both of them and had to be dissolved legally. Joseph didn’t want Mary to suffer public humiliation so he decided to quietly step out of the picture and let her move on with her life as best she could. What he didn’t know was that God had chosen him for a great purpose. Though Joseph wasn’t the biological father of the Child, God chose him to be the man that would act as the earthly father of the Messiah. The angel came to Joseph and reassured him. “…fear not to take unto thee Mary thy wife: for that which is conceived in her is of the Holy Ghost.” Matthew 1:20b. Joseph had known Mary was pregnant, but apparently she hadn’t told him that the Child’s Father was God! That would be hard to explain. The angel said that Joseph wasn’t to be afraid to take Mary as his wife, and so he did. Mary must have been relieved. Joseph also proved himself to be worthy of God’s favor because he was willing to wait until after her Child was born to consummate their marriage. “Then Joseph being raised from sleep did as the angel of the Lord had biddenhim, and took unto him his wife: and knew her not till she had brought forth her firstborn son: and he called his name JESUS.” Matthew 1:24-25. This dispels another myth. Some people believe that Mary was a perpetual virgin, but that’s just another of man’s fabricated stories. Joseph and Mary did consummate the marriage after Jesus was born. Scripture says Jesus was her “firstborn” which implies at least a “second born” child. Joseph and Mary did have children together, and their names appear later in Scripture. Don’t let anyone convince you that Jesus wasn’t God incarnate. He had no biological human father, which means His blood wasn’t tainted by Adam’s sin. That allowed His pure blood, which He willingly shed on the Cross of Calvary, to take away the sin of anyone who sincerely comes before Him and asks for forgiveness. It was through Mary that Jesus was human, which qualified Him as our Kinsman. “If thy brother be waxen poor, and hath sold away some of his possession, and if any of his kin come to redeem it, then shall he redeem that which his brother sold.” Leviticus 25:25. When Adam ate the forbidden fruit he sold what he possessed. No longer could he walk with God and Paradise was lost. Unlike the sacrificial blood of animals to cover sin, only God’s pure blood can take sin away. Because Jesus was fully God and fully human He was qualified to be our Kinsman Redeemer and purchase back what Adam lost. “For verily he took not on him the nature of angels; but he took on him the seed of Abraham. Wherefore in all things it behoved him to be made like unto his brethren, that he might be a merciful and faithful high priest in things pertaining to God, to make reconciliation for the sins of the people.” Hebrews 2:16-17. Jesus is God and His love for us is the reason He entered His creation as one of us. He was born in a manger in Bethlehem in order to offer us the gift of redemption that can only come through His shed blood. There is no love that can be compared to the love of God. Joseph took care of Mary and was obedient to follow God’s instructions. They traveled to Bethlehem because of a census, and that’s where Mary gave birth to the Messiah, which fulfilled prophecy. The lowly shepherds were the first to visit Jesus in the manger where He was born and sometime later the wise men came from the east to worship the newborn King. They brought gifts of gold, frankincense, and myrrh and these gifts probably financed the hasty trip to Egypt, another fulfilled prophecy. “And when they were departed, behold, the angel of the Lord appeareth to Joseph in a dream saying, Arise, and take the young child and his mother, and flee into Egypt and be thou there until I bring thee word: for Herod will seek the young child to destroy him.” Matthew 2:13. Herod was evil and, in an attempt to thwart God’s plan of salvation, Satan inspired him to send soldiers to murder all children in Bethlehem who were younger than two years old. If Joseph hadn’t been obedient, Jesus would have been killed. 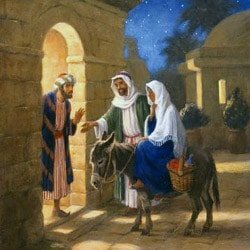 Both Joseph and Mary were asked to step out in faith and trust God. Even though they didn’t understand the whole picture, they obeyed God step by step and day by day. Their goals in life were honorable: Joseph had a carpentry business and was able to support a wife and family and Mary’s desire was to be a wife and mother. Their lives were changed because God had higher plans for them. Because of their obedience the entire world was changed. You are an important part of God’s plan. Even though you don’t understand how God will accomplish His will through you, are you obedient? Instead of trying to out-think God, simply obey Him. He worked out the details for Joseph and Mary, and so He will work out the details of what you are called to do. Simply trust Him.